When Dr. Percy Spencer’s chocolate bar melted in his pocket, the idea of the microwave oven was born. Using electric current flow through a conductor, the microwave is capable of just about anything. Thus, on those bleak, rainy days when the walk to the dining hall seems impossible, the microwave is your answer. On the days when your points are running low but you desperately need a satisfying meal, look no further than your microwave. It's the solution to everything! Never put stainless steel containers in the microwave. Only use plastic containers that are microwave safe. Ideal containers are made of glass or ceramic, but be careful! It’ll be hot when it comes out. If you want to add any other foods to your scrambled eggs, such as onions, now’s the time! Cook 1½ to 2 minutes longer on high. If your eggs aren’t quite turning out as fluffy as you want them to be, try adding some more milk or lowering the microwave settings. You can also try microwaving in shorter increments. If you want to add some pizzazz to your scrambled eggs, try adding your favorite cheese before the second round of microwaving. First rinse the rice 2 to 3 times with cold water. It is properly rinsed if the water is no longer cloudy. If fluffier and less sticky rice is preferred, let the rice soak for at least 30 minutes after rinsing. Drain the rice. Refer to the package directions to see the correct water to rice ratio for the specific kind of rice being cooked. If you are not sure, a 2:1 ratio of water to rice is usually ideal. In other words, if you use 1 cup of rice, add 2 cups of water for cooking. Warning: The container being used should be about 4 times the size of the rice and water. 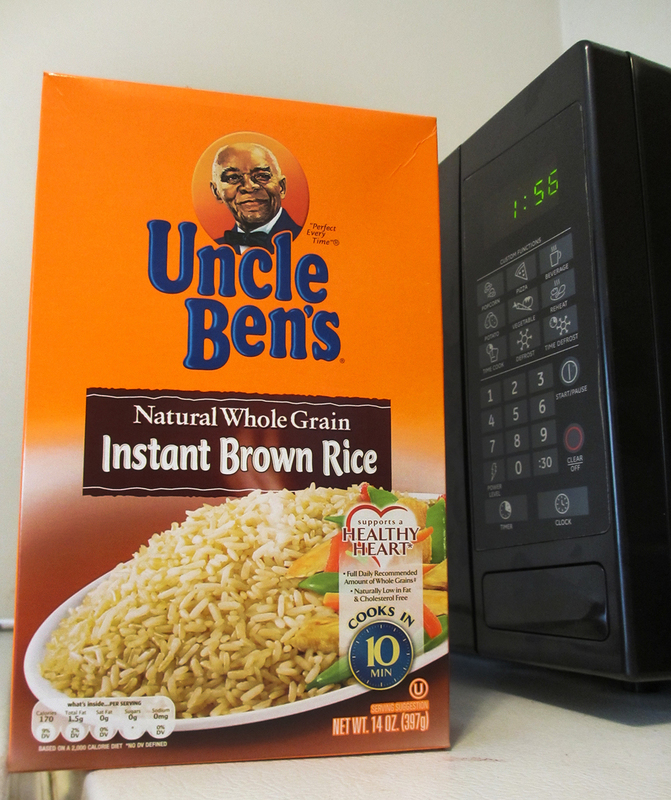 Rice expands as it cooks and this will prevent overflows in the microwave. Before cooking, add salt, vegetable oil, olive oil, butter or whatever you prefer to help add flavor to the rice. These ingredients can also be added after cooking. Add a teaspoon of oil or a ½ tablespoon of butter per 1 cup of rice. Stir the mixture slowly in order to combine the ingredients thoroughly. Partially cover the container and place the mixture in the microwave. Make sure that there is a way for steam to escape the container so as to prevent the container from bursting. Cook the rice according according to the following times, these measurements have been calculated for a 600 watt microwave similar to the Boston University microfridge. After the rice has finished cooking, don’t open the door. Instead, allow the rice to sit in the microwave for about 5 minutes. After the 5 minutes period, season or fluff the rice and enjoy! If you use brown rice, you will need a 3:1 ratio of water to rice. Microwave it covered for 8 to 10 minutes or until the water boils. Then carefully remove the cover, open away from your body to allow steam to escape. Continue to microwave the rice for about 20 minutes or until most of the water is absorbed. If your rice is too sticky, try adding less water next time. If your rice is too dry, you can always add a little more water and microwave it for a few extra minutes. If you’re reheating rice, try sprinkling a few drops of water or covering your rice with a damp paper towel. This will help keep the flavor and prevent the rice from becoming crunchy or dry from reheating. Place the tortilla chips on a microwaveable plate. Pour taco sauce over the chips. Microwave for 1 to 2 minutes or until the cheese has melted. If you prefer, you can add jalapeño pepper slices or salsa along with the cheese to increase the flavor. You can also mix different types of cheeses.